Costa Rica Fishing is considered to be some of the finest in the world. Known for its abundant wildlife and parks Costa Rica’s biodiversity continues into its oceans as well. Costa Rica’s pacific coast is home to some of the best sport fishing species in the world – and in abundance. Species such as Sailfish, Marlin, Dorado, Tuna, Wahoo, Roosterfish, Snapper, Jacks, Mackerel, and more, are seen and caught in these waters. During your fishing trip don’t be surprised if you sight leaping Stingrays, Manta Rays, breaching whales, flying fish, leatherback turtles, and other aquatic species. 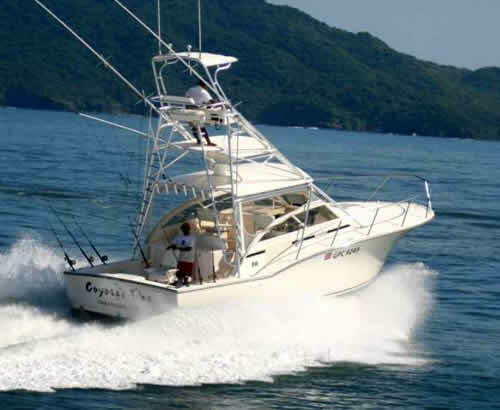 The northern pacific of Costa Rica’s fishing grounds are well known. There are well established tourist friendly towns such as Tamarindo where one can find a variety of accommodations, restaurants, and activities post-fishing day. That is where Coyote Sport Fishing Charters is located. Tamarindo, situated in the province of Guanacaste, is also the driest area of Costa Rica so, it’s dry (high) season tends to be longer and drier beginning usually in early December and ending some time at the beginning of June. Crazy Dog: Step aboard our recently remodeled 31′ boat. Beautifully designed, with plenty of room and space to move around for the times when hard fishing requires it. This is boat with plenty of power to get you where the fish is. Of course it comes fully equipped with the finest tackle such as Penn International and Shimano fish finder, marine VHF radio.